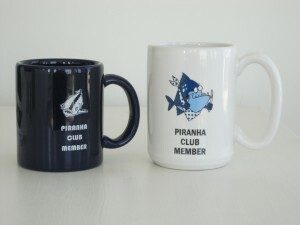 The Piranha Club is an invitation-only club of analysts and clinical program designers that have demonstrated the art and practice of lovingly ripping the ideas of colleagues to shreds and/or graciously accepting constructive criticism of their ideas and work from others. These mugs are awarded to members at Blue Cross Blue Shield of Michigan, and have the BCBSM logo on the reverse side. The Piranha Club originated at Henry Ford Health System in 1994, and continued at Reward Health Sciences and BCBSM.